This last weekend I had the pleasure of being in Prescott for the 60th Annual Arizona Historical Society Conference. 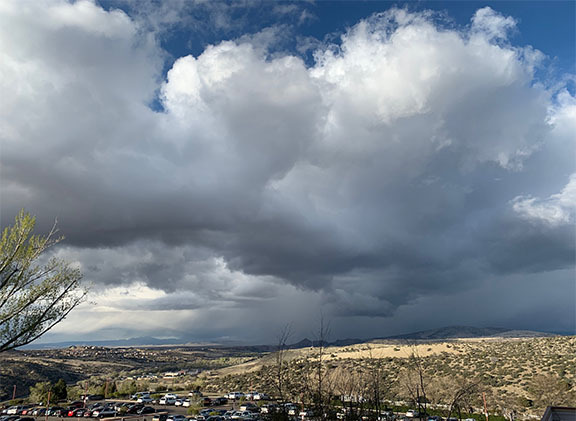 On Friday I went to a couple enlightening sessions and learned a bunch, assigned a few articles, and then returned to my room on the third floor to freshen up for dinner, and walked out on the terrace just in time to catch this dramatic scene of a storm rolling in. There was a storm of a different sort on Saturday when three people gave papers on Sharlot Hall. 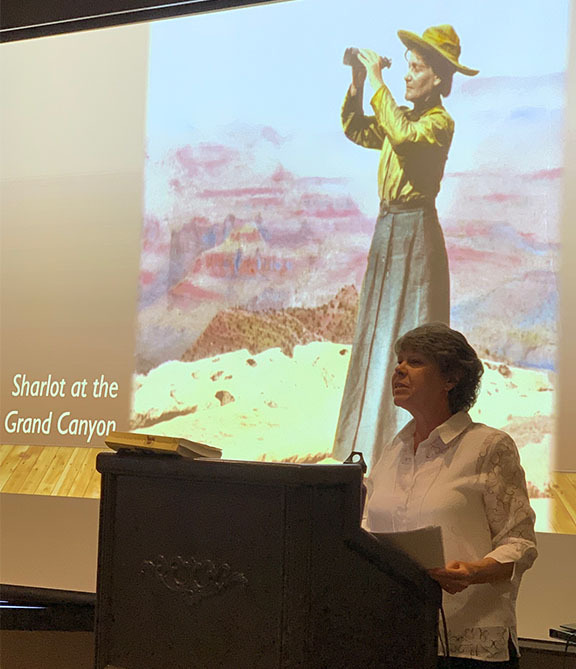 Mary Melcher was followed by Jan Cleere who also provided interesting and insightful information about Arizona's most beloved historian. 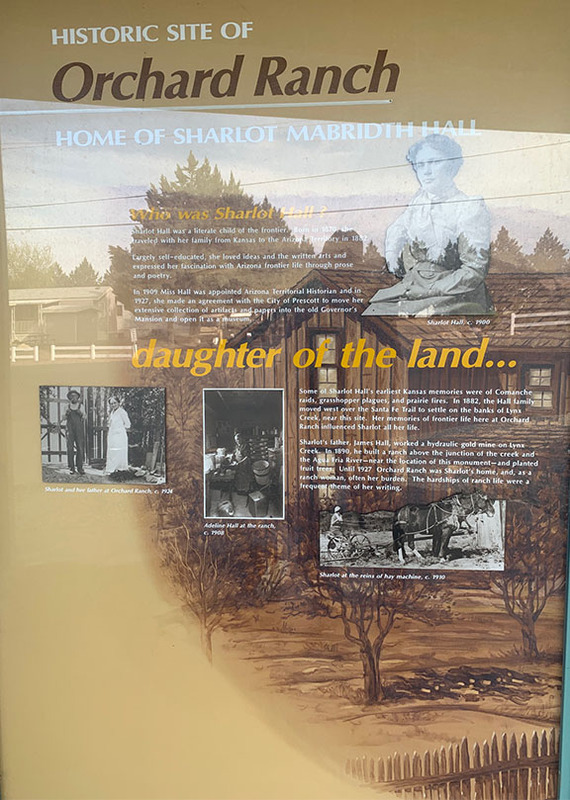 One of the tidbits I wanted to learn more about is what happened to the Orchard Ranch where Sharlot and her family lived for a quarter century. I learned that after the death of her mother and father, Sharlot sold the ranch in 1929. By the 1960s the main house was a leaning wreck. My regret is that I drove past the Orchard Ranch in 1966 on my way back to school (University of Arizona in Tucson) but I never looked because I didn't know what it was I was looking at until recently. Today the Orchard Ranch is an upscale trailer park for retired people and all that remains is a kiosk near the front gate paying homage to Sharlot and her family's ranch. The ranch is just west of Fain Road at the edge of Dewey, and I have driven this way to Prescott a hundred times and never thought to even stop. On Thursday, on the way up the hill, I stopped to take a look. 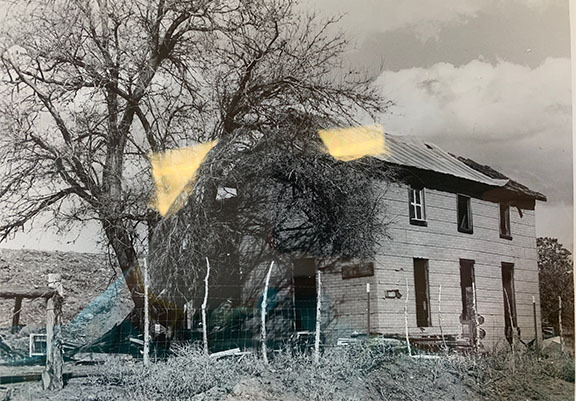 I walked into the community center, which is about 100 yards from the kiosk, and asked an old gent (who was probably five years younger than me) if he knew where the old ranch house location was and he looked at me and said, "They moved the house to Prescott." I wanted to say, you sure know a lot for being so damn dumb, but I refrained. Someone else looked at me like I was crazy and said, "There was a ranch here?" Well, yes, it's called The Orchard Ranch Trailer Park for a reason. All of which reminds me of the time I was out at the site of the Wham Payroll Robbery, west of Safford, and a rancher, who proudly told me he had lived out there for 60 years, responded to my question about the route of the payroll stage, in 1888, by stating, with some alarm, "There was a fort at Fort Thomas?!" All his life, it was merely a mini-trading post and gas station and it never occurred to him that it was an actual fort. And people wonder where the term local yokel comes from. But I digress. Both presentations on Sharlot Hall were exemplary and thorough, but when it came time for questions, an ugly aspect of Sharlot's life came up. A woman sitting behind me with her arms folded wanted to know why neither presenter mentioned the fact that Sharlot was estranged from her brother Ted because he had married a Mexican woman, Petra Acosta of Sinaloa, and, according to her biographer, Sharlot had never spoken to him again. A close friend of Sharlot's, Grace Sparkes, had no idea that Sharlot even had a brother, because she never mentioned him. This made for an awkward exchange, followed by the woman behind me, wondering aloud if the life of Sharlot had been "cleaned up" for public consumption. My weekend inquiries in the mile-high city turned up other local scuttlebutt about Arizona's most-loved historian. • Sharlot was rumored to have had several affairs and catty women around Prescott called her "Harlot Shall." • She pulled a gun on a ferryman. • She was not a feminist she was a humanist. • She was a Republican. • Many letters were destroyed after her death along with many by her close friend, the painter Kate Cori, who is buried in the Hall family plot but there's no mention of Kate in the official biography of Sharlot by Margaret F. Maxwell. Sharlot also was sued by a publisher for not producing a book on the history of Arizona. And when she donated the draft of another history book by a friend she withheld 200 pages which was found in her belongings after her death. I would argue that this is typical writer-researcher behavior (I am guilty of the same on both accounts). Plus, and I say this with total admiration: I totally dig the fact that she pulled a pistol on a ferryman. Proving, once and for all, that when it comes to local yokels, I am a charter member.